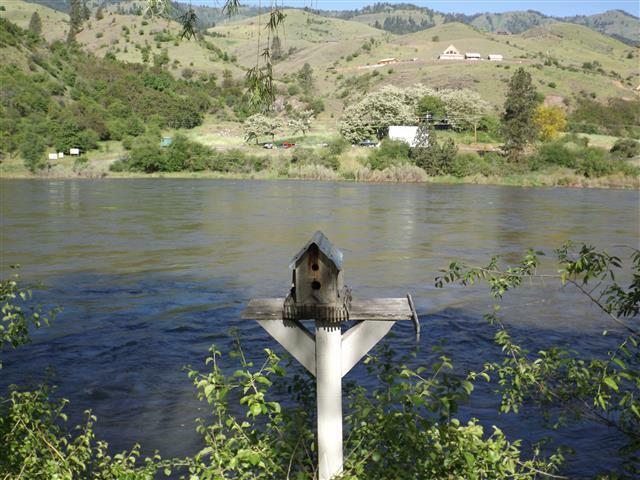 Bird House has ‘bird’s eye’ view of the Salmon River, just as our guests do! Swiftwater RV Park is located riverside on the Salmon River in White Bird Idaho, and is open year ’round. It is the closest private campground to the Hells Canyon National Recreation Area. With 300 feet of Salmon River frontage, the views are stunning. And the ‘atmosphere’ is ultra relaxing! Do you have your own mobile satellite TV service? No worries because all of our spaces are satellite friendly featuring a clear view of the southern sky. All trailers and RVs can be backed in to the river frontage RV sites, or head in directly, offering beautiful un-blocked views of the Salmon river and welcome shade from our mature Willow trees. For those that prefer pull-through sites, the grassy center island area offers pull-through convenience and shade trees. Check out what other guests say about us on Trip Advisor by clicking this link. To inquire about availability and reserve your camp site visit our reservation page to send an email inquiry. We’d love to hear from you! The laundromat and clean restroom facilities are just a short walk away. A dump station is available and safe, offsite parking for extra vehicles is right next to Swiftwater RV Park. We also just purchased a towable mobile sewer transport ‘Blue Boy’ for long-term guests. You’ll enjoy your stay here in White Bird, Idaho at our rural river and mountain environment. It’s a stress-free, relaxing vacation whether you are camping in a tent, vintage trailer, truck camper, popup trailer, larger travel trailers, 5th wheels and motor coaches. Hope to see you at the campground soon!